The Forum on NGO Participation in the Work of the 51st Ordinary Session on the African Commission on Human and People’s Rights and the 25th African Human Rights Book Fair, organised and facilitated by the African Centre for Democracy and Human Rights Studies in collaboration with the African Commission on Human and Peoples’ Rights and the NGO Forum Steering Committee was held at the Kairaba Beach Hotel, in Banjul, The Gambia from 14-16 April, 2012. The Forum brought together over 200 participants and facilitators from over 26 countries in Africa and included participants from in Europe, and the United States. The participants and facilitators were generally from Non-Governmental Organisations with a few representatives from National Human Rights Institutions and government non-governmental organisations in the deliberations. Five Commissioners participated at one point or another. A number of Commissioners of the African Commissioners or steered the discussion in the Special Interest Working Groups relevant to their mandates. This participation was noted and welcomed by all participants, which was a source of motivation. The three-day activity was declared open by Hon. Commissioner Soyata Maiga, Special Rapporteur on the Rights of Women in Africa on behalf of the Chairperson of the African Commission on Human and Peoples’ Rights (ACHPR); The keynote address presenting an overview of the situation of human rights and democracy in Africa was delivered by Madame Souhayr Belhassen, President of the FIDH (International Federation of Human rights Leagues). Various representatives including the Attorney General and Minister of Justice, Mr. Lamin Jobarteh, who welcomed participants; A Representative of the NGO Forum Steering Committee – Mrs. Paulette Oyane-Ondo; and the Executive Director of ACDHRS made statements at the opening ceremony. The occasion was chaired by Mr. Mohammed Mabassa Fall, Executive Committee Member, Governing Council, African Centre for Democracy and Human Rights Studies. 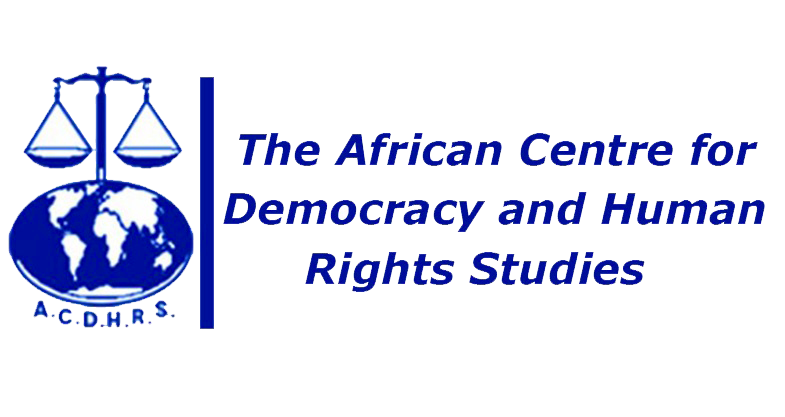 New Developments in the human rights and democracy situation in Africa: The inaugural presentation by Madame Souhayr Belhassen highlighted the state of human rights and democracy in Africa as well as the rights of specific groups. She acknowledged the progress made by some states and noted the deterioration in others due to armed conflict, tribal wars, calamities and environmental degradation and failure in constitutional obligations. In the session that ensued, The Forum then concentrated much attention on the two countries whose country reports would be considered at the 51st Session, namely Sudan and Angola. Reports on Sudan, while praising an African Charter compliant country tolerant enough to allow a woman to run for the presidency, the voices remained equally critical of the continuing genocide and impunity in that country. In a presentation supported by film footage, Angola was depicted as having made some positive strides especially developments in meeting the MDGs, the brutal suppression of the freedom of expression, freedom of association and the curtailment of freedom of information was a cause for concern as were severe violations of the rights of women. Corruption and nepotism, it was pointed out, is a syndrome in both countries. Diverse situations were raised, including legislations to muzzle freedom of the press and media and the hazardous situation of human rights defenders, among others. Considering the conflicting array of news coming out of Mali, and the interest it has been stirring in Africa and beyond, The Forum was also briefed on the situation. The worsening humanitarian crisis in that country torn in two with various rebel factions in the northern half struggling for independence while the other half is recovering from the rude shock of a coup d’état barely a month before elections which has tarnished the 20 years of democracy in that country. The need for humanitarian assistance was a matter of urgency as famine is creeping in that Sahelian landlocked country. Thematic special interest groups reviewed the situation relating to Refugees and Internally Displaced Persons; Minorities and Indigenous Persons; Women and Children; the Death Penalty. Human Rights Defenders; the International Criminal Court; Torture; the African Court; the International Criminal Court; and Freedom of the Press; Torture; Prison conditions and many others as well as proposed strategies for effective networking and participation in the African Commission. In reviewing the positive developments best practices were show cased. Women and property rights were highlighted, with an emphasis on ownership rather than just possessory rights. Beneficiaries of the project have made strides in Ghana, Cameroon, Nigeria and Tanzania and elsewhere in interventions providing legal aid as well as making the linkages between knowledge, ownership and HIV/AIDS. It was noted however, that in spite of much success, sustainability after donor withdrawal remains a challenge faced by a number of the grantees. Another best practice was the operationalisation of UN Resolution 1325 as an ideal mandate for the participation of women in the political process and the example of the ‘Situation Room’ as a tool that has trained women to take their place in the electoral processes was also shared reinforcing advocacy for greater involvement of women in the electoral process successfully implemented in Liberia and Senegal. However, the challenge of meeting the quota for women’s representation remained. In continuing the celebration of 100 years of women’s rights advocacy, The Forum highlighted many other developments including discussion on reproductive health and rights centred around Article 14 (1) (e) and (d) of the Protocol on the Rights of Women in Africa. Emphasis was also made on the need to further develop advocacy strategies for the universal ratification and implementation of the Protocol to the African Charter on the Rights of Women in Africa as well as the African Charter on Democracy, Elections and Governance. The intersection between HIV/AIDS and human rights promoted the use of the Protocol as one of the main tools to address this endemic was reviewed bearing in mind the fact that women suffer much more than men under the scourges of this pandemic, especially under a climate of violence against women. The disturbing situation of human rights defenders was brought to the fore with the viewing of a poignant film show on “The Chebeya Affair : A State Crime” a chronicle of an exceptional trial and fascinating political thriller about the work and death of Floribert , Chebeya, the late human rights activist from the Democratic Republic of Congo. The Forum discussed in depth the issue of Freedom of Expression and Access to Information led by the African Platform on Access to Information campaign. Rooted in the provisions of Article 19 of the Universal Declaration of Human Rights, Article 9 of the African Charter on Human and Peoples’ Rights, Article 4 of the Declaration of Principles on Freedom of Expression in Africa and the Windhoek Declaration on Press Freedom. It was worthy to note that 18 AU member states provide constitutional guarantees to access to information. The Forum was urged to endorse the need for governments and relevant bodies to advance the right of access to information. Furthermore, discussion on state broadcast systems taking into consideration the values entrenched in the Declaration of Principles on Freedom of Expression in Africa revealed that reform has been slow. The call was therefore raised for the urgent transformation of public broadcasters to unfettered systems free from political interference and governed by independent boards answerable to parliaments. Access, it was opined, is no longer a media or journalism matter but is about human rights. The intersection between human rights violations and extractive industries in Africa was revisited in greater depth during this session. Presentations highlighted the environmental challenges, safety, security and the sometimes corrupt collusion with states and non state parties as well as customary law and the need to consider reparation for damage to land and society. It is evident that capitals where diamonds are mined have the poorest neighbourhoods and worst quality of lives. The Forum requests the African Commission to urge states and the international community to address the situation by developing and or harmonising legislation to reflect rights and environmental protection as well as other accountability and monitoring mechanisms in collaboration with human rights groups. In the same vein, it was also agreed that reparation should be given much attention. In line with the objectives of the Networking for Human Rights in Africa session, which was geared towards the provision of more information between the three main partners i.e. the African Commission; States; and Civil Society, in the development and maintenance of an effective human rights community, the Forum was updated on some of the advocacy interventions by civil society at the UN Human Rights Council in three main areas of interest to the Forum, namely the case of Eriteria, Libya and LGBTIs. A degree of success was registered in all three cases. Opportunities for networking and collaboration continue to be at the core of Forum. It was therefore worthy to note that networking and collaboration continues to be one of the objectives of the Forum. Relationships among civil society and between civil society and other partners especially the African Commission were examined to consolidate on the strategies for effective collaboration between these groups with a common goal of promoting and protecting human rights in Africa. Civil Society access to support and collaborate with this network among others was revisited and shared among participants. Consultations were held to enhance the development of the Defending Civil Society toolkit developed by World Movement for Democracy seeking to address principles that enhance the observance and respect of human rights defenders in a bid to collect and share various tips and inputs for the sharing of information. As is usual, the sessions were well attended and characterised by a dynamic and interactive participation coupled with a sense of purpose as well as constructive exchanges of information, experiences and expertise. Participants approached their work with much determination, energy and objectivity. We recognized and applaud the progress made by the African Commission and its mechanisms to ensure the effective promotion and protection of human rights in Africa. The Forum on the Participation of NGOs in the Work of the 51st Ordinary Session of the African Commission on Human and Peoples’ Rights was declared closed by the Chargée d’Affaires of the European Union Mission in the Gambia, Madame Agnés Guillaud. The Representative of the Commissioner for Political Affairs, Dr. Salah Hammad gave an update on the development of the Human Rights Strategy for Africa, the Africa Governance Architecture; the Africa Governance Platform and the Year of Shared Values. Other speakers included H.E. Mrs. Catherine Dupe Atoki, Chairperson of the African Commission and Mr. Mohammed Mabassa Fall on behalf of the Chairperson of the African Centre for Democracy and Human Rights Studies; Mr. Abdoul Gadiry Diallo, a member of the NGO Forum Steering Committee. The vote of thanks was made by Sister Gertrude. On behalf of the Forum, Resolutions and Recommendations have been formulated and will be forwarded, to the African Commission for their kind consideration. The Forum took the liberty of reviewing some of these resolutions and recommendations from the previous Forum. They will also be shared with all interested partners.